Land issues which had caused a lot of unhappiness in Kuching and Simujan last month had now shifted to Sarawak’s central region where 13 Tuai Rumah have formed a committee to fight against a Sibu tycoon who was alleged to have bought over 6,000 hectares of their Native Customary Right (NCR) land in Daro. Nine Tuai Rumah from Daro, a two-hour boat ride from Sibu had lodged police reports during the weekend while four went to the Sibu Central Police station Monday to lodge their reports against the company which was said to have encroached into their NCR lands at Block 12 Engkilo/Seradang Land District along Sg. Lengan Labaan, Pulau Lebaan, Daro. The group was led by a Dayak who only wanted to be known as Robert. Robert said the Tuai Rumah were not interested in turning their NCR land into political issues but more interested in getting back what belonged to them. They claimed to have evidences of ownership to the land as they had with them documents of their land issued by the British government in 1942. 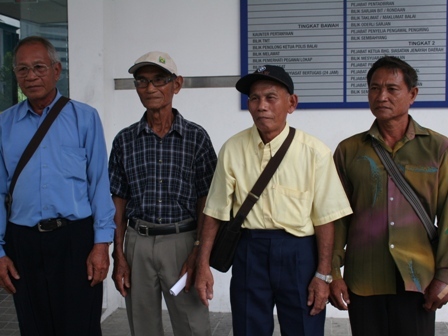 A protem committee – comprising David Majang as chairman, William Limbat vice chairman, Simon anak Amuta as secretary and Anthong Ijan as treasurer – has been set up to look into the possible settlement of land issue and campaign against oil palm plantation. Robert said they had engaged a lawyer and wanted to seek a court injunction to stop the oil palm plantation company from working further on their lands. Last weekend, the group had sought the help of Daro State Assemblyman Murni Suhaili and asked him to attend a dialogue session with them at Rumah Francis Kiai anak Pengarah. The 13 Tuai Rumah/Wakil Tuai Rumah gathered for the dialogue session were from Rh. Seli, Rh. Lanting, Rh. Igat, Rh. Leang, Rh. Guang, Rh. Francis Kiai, Rg, Jawa, Rh. Nyait, Rh. Kaming, Rh. Bungkok, Rh. Baying, Rh. Jinga, Rh. Jimmy and Rh. Sintan. They were worried as heavy machinery was seen cutting roads and drainages construction geared for the plantation at Lebaan. Murni who did not turn up at the dialogue session did not dampen the mood of the Tuai Rumah who themselves discussed on how best to deal with the matter. They then held up banners to protest the company from encroaching on their lands. After the protest, nine came to Sibu to lodge police reports. A Tuai Rumah said their area at Pulau Lebaan was a low-lying flood prone area and should there be flooding, the fertilizers used at the oil palm plantation would cause pollution to their river which they used for drinking and washing. The kampungs there did not have piped water. They were also worried of environmental hazard caused to the flora and fauna in the area as they obtained food which included bidin, paku, wild mushrooms, bamboo shoots, potatoes among other jungle produce. The longhouse folk (right) claimed that the 6,000 hectares of their NCR land was sold to the company for RM2.3 million which was against their heritage right. A tuai rumah said if they cannot fight it alone, they would look for options to get back their lands. Land has been a thorny issue in Sarawak, be it state land, private land or NCR land. Just last month, 3000 acres of private land in Bako, Kuching, had been acquired by the State Government which caused a furor. The dust has barely settled. The land owners made a beeline to the Opposition and formed committees all over the states to protest over their lands which they claimed compensation from the Land and Survey was too minimal. At Simujan, a timber camp was burned down and the operators alleged that it was from the villagers nearby who protested that the land was under NCR. The operator of the timber camp claimed to have a licence to operate and that losses was RM2 million. The villagers were angry at the allegation and seven had been arrested and later released after being detained. The villagers claimed that they were at a roadblock four kilometres away from the camp which was on fire then. 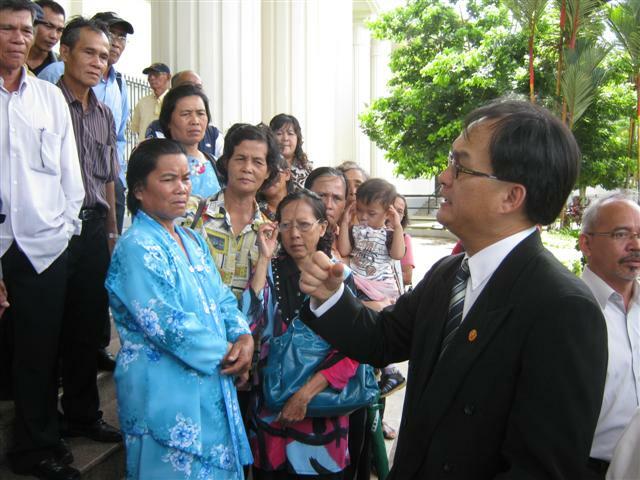 PKR State chief, Baru Bian filed a suit for the villagers of Simujan against the timber camp in the Kuching High Court on Monday. The requisition of land by those in power has been a sore point raised by the Opposition in the past. The ruling elite, however, has always insisted that they took over land for the purpose of development. The state today is under the second wave of development, if recent statement by the ruling government is to be believed. The Opposition, in the meantime, has insisted that the requisition of land is always to the advantage not only to the current leadership, but also to enrich its cronies. Land of all classification have been taken over under the state questionable Land law under all sorts of guises, and was recently exposed by the Opposition that they have been given to family members and cronies of the ruling elite. The indigenous people in the interior of Sarawak are no more content to accept their fate when their NCR land, which most of them have inherited through family ties, are being taken by the state. They are now more educated on the laws of the land, and with the support of NGOs. 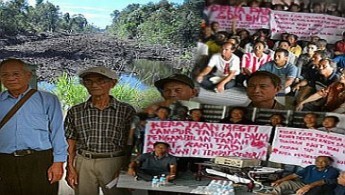 NEWS FOCUS SIBU – Land issues which had caused a lot of unhappiness in Kuching and Simujan last month had now shifted to Sarawak’s central region where 13 Tuai Rumah have formed a committee to fight against a Sibu tycoon who was alleged to have bought over 6,000 hectares of their Native Customary Right (NCR) land in Daro. The issue of NCR land is going to be a sore issue in the coming state elections, and many have seen it as a negative implication for a number of seats for the ruling state government. The thief minister of UMNO controlled Sarawak is one of the richest man in the world. The current PM is fast catching up as one at least through his wife, the ugly but powerful fatty mama who sits in for the PM on official functions whenever the PM was indisposed. The DPM and the entire cabinet of Najib have no ministerial power and even the DPM has been reduced to a chief usher when the Australian PM and USA Secretary of State visited Malaysia few days ago. Rosmah was in command and gave speeches on behalf of his politically unfit husband and PM of UMNO and for UMNOputras and tycoons. History has shown that countries run by the powerful wife of its PM or President eventually collapsed and went bankrupt like in the Phillipines under Imelda Marcos and Evita Peron in Argentina. Here in Sarawak and Sabah, 70 % of the people who lived just 20 km away from the city to the interior are living in poverty and deprived of decent and basic amenities and having their lands encroached into and taken away by the same people who walk in the corridor of power..the government they have voted for the past 47 years. With the passing of PBB initiated white paper to protect and preserve the ill gotten wealth of the thief minister of UMNO controlled Sarawak, any person, NGO or political party who are telling the truth and educating Sarawakians of their rights, defending the rights of the marginalised and oppressed will be deemed to be creating havocs and endangering racial instability and security in Sarawak. All Sarawakians must not allow our government to become the like of Myanmar or North Korea to strike fear, intimidate and subject us into total subservience. From now on we shall strike back and strike harder and deeper into the interior constituencies held by UMNO controlled BN. We must uproot Taib Mahmud’s and UMNO controlled BN’s authoritarian regime. Look the truth is there. Our rural folks though acquired lower education they have a better sense of the environmental impact than the NREB; of how the chemical and other artifical additives formulated in the fertilizer could affect their future health. Their reasoning holds water right! In event of any floods due to the planting in lowlying ground the fertilizers would definitely create not that of pollution but poisoning because of the decomposition a mixture with water thence drawing back into the river. Again the water is poisoned and surely it will draw a setback on all the bio-ecological lives in the river hazardous to all living creatures. Water is also a source for cleaning and bathing. When rain-water went dry the river water is the only alternative. How are these poor rural folks to survive without fishing in the river which is one their natural livelihood. How many years already have they been waiting for the very basic amenities, clean pipe water and electricity. Allocating water tanks only serves as home reservior. When no rain, what is the point of those tanks? Hiding mosqutoes! Bravo … our poor rural kampong folks but they rich in environment consciousness otherwise not many actually aware that such particular pollutions did come from the unchecked developments in our green Fair Land Sarawak. On the issue regarding the Bako private land the calculation did the L&S appeared too narrow minded, unprofessional. Worst than Ah Long! I believed many the landowners are genuine ownership who having been using the land for economic returns. When Section 47 was imposed these landowners are indented with much great uncertainties over the future livelihood. Why the public have to be blanketed on the purpose of the acquisition? If they were to sell their at the time, where and how are they to restart their farming? Who to sell? The time frame on the Section 47 is far too long that creates many predicaments among the landowners themselves. Yr2010-Yr1973=About 38 years. Many their children may already become grandfathers. As the family grows the land shares shrink too becoming a scarcity commodity. Therefore the selling of the land will somehow never on their mind. All children wish and hope looking for to a reasonable compensation. Take for example the calculation adopted by the L&S Superintendant apparently the fellow ignored totally the considerations the value of the land be appreciated based on the land economic returns. For say the land could produce an average income of RM100.00 per month the one acre and overall the 37 years the landowner would definitely hold to maintain the land price at least RM44400.00 today. This is based on the most conservative method – A government clerk salary in 1973 started with a basic pay of RM180.00. Now the starting pay is say RM820.00. This shows a 4.55X increases over the period. If this is to add onto with a compound 8% interests the land will worth 84,900.00. With that sum the landowner will have to forgo his land and farm for life. What the price of a low cost house? Changing of a new profession isn’t come that easy from a farmer life too! Since the acquisition involves a vast tract of land common then landowners ask a btter deal. Opt for a joint venture with that government project! This objective may help also check and balance the hidden agenda of the Capt. Demon Ring & The Gang their motive. Hey, never come the bandwagon guys!